Working visually, whether in a group or individual setting, can be very effective when done correctly. I’ve been in the Interactive-Visuals field since the mid 1990s – and have worked in all of the four main genres: studio work, graphic recording, graphic facilitation and graphic coaching. As the field continues to expand and generate more and more interest, I find it’s helpful for people new to the field (either as practitioners or clients) to understand the four main ways of working visually and how they are similar … yet also how they are very different from one another too. Below is a video from a recent offering of my Fundamentals of Interactive-Visuals online workshop … in which I introduce a chart that sums up the four main ways and their distinctions. You’ll see I place particular focus on the level of ‘interactivity’ of each method – ranging from passive or ‘push’ style on the left to the interactive or ‘pull’ style on the right. The view on the video is small (be sure to hit the ‘expand button’ in the lower left corner for easier viewing). Also, here’s the map I share in the video (my students have it in their extensive handbook). Wonderful World of Interactive-Visuals Chart (four main definitions). The most scripted and constructed type of visual work is STUDIO WORK. Studio work consists of various visual materials produced in the sanctity and quiet of the practitioner’s studio (without a live group context). The content may come from something off of the web (i.e. a TEDTalk). Or it may be content that was previously collected during a live setting (i.e. rough visioning or planning information). Or, it can also be content that is provided by a person, design team or from documents. Studio Work can vary from very practical and easy pieces (like welcome posters, models, or agenda charts (like the one shown below from an old workshop of mine) — to much more elaborate ‘information architecture’ pieces that takes days or weeks to complete and deep pockets to commission (info murals, whiteboard/explainer videos, etc. Generally, studio pieces are used to explain or ‘PUSH’ agreed upon information to viewers (there is usually little interaction back, so it’s a one-way info transfer). Moving up the interactivity scale, slightly, we proceed into the area of GRAPHIC RECORDING. Produced by Graphic Recorders these large, wall-size documents are created live during gatherings and meeting venues – usually the Recorder is silently doing her or his best to ‘cut’ or ‘cull’ what is being spoken about into an attractive (and hopefully logically useful) visual summary. This method is best used when the topic is a general and easily tracked nature. Graphic Recording is not useful for highly detailed situations, for those situations it’s best to default to Graphic Facilitation methods. Example of Graphic Recording: Highlights of a Talk on Branding at a Women’s Funding Conference. 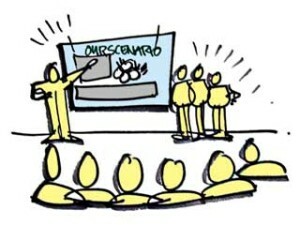 Graphic recordings are usually produced to the side or back of a room, off from where the main action is taking place. Having done this kind of work for many years earlier in my career, I am at liberty to call them a “bit of a party trick’’ or even “performance art”. Entertaining, fun to produce, and adding spice to an event — they can operate as novel takeaways for event participants and conveners. However it is challenging to build in a true transfer of meaning with them, especially for folks who weren’t in attendance (the Recorder learns a lot by visually translating things but unfortunately that meaning rarely gets transferred back to the meeting participants effectively). And, even more unfortunately, some clients (and even practitioners) assume that Graphic Recording is all there is to the field. When it’s not by a long shot … there are SO MANY more interactive and useful ways that the visual medium can be employed into process design. Next we move into the area of Graphic Facilitation – in my mind the most useful genre for group work. Graphic Facilitation can either be provided by a true Graphic Facilitator (someone who both designs and leads/facilitates a client engagement AND takes the visual notes at the same time) or via a Graphic Facilitation team (provided by a lead Facilitator and one, or several, Graphic Recorders). 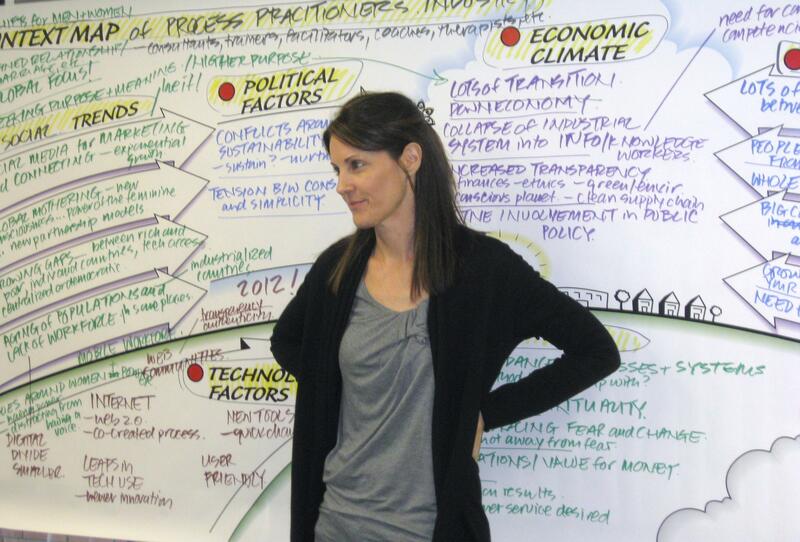 Given the facilitative nature of the work, Graphic Facilitation has a more text-based and functional appearance than Graphic Recording and the charts are co-created by the participants in conjunction with the facilitation team. It is by far the most interactive of the genres — with the charts being created in front of everyone’s eyes and through everyone’s words (sometimes through everyone’s markers when participants are invited to get in the mark marking as well!). Graphic Facilitation is often done via pre-constructed templates or large wall forms (like the Content Map from Grove Consultants behind me in the picture below), although spontaneous emergent process is also possible. And, last but not least, we come to the specialty niche area of which I’m a pioneering practitioner and mentor – Graphic Coaching (the use of interactive-visuals in coaching, therapy and other personal growth with individuals, couples and/or families). 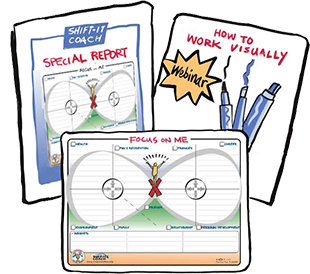 Graphic Coaching is interactive at its core (like graphic facilitation work) but instead of a group you are working with just one person or partners. Graphic coaching can be spontaneous recording of a person’s thoughts or it can be much more constructed – depending on the type of coach, therapist or counselor you are and the process you follow. 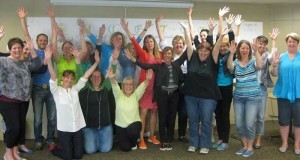 After many years of doing group facilitation (primarily strategic planning and visioning) and coaching work (I am a CTI trained coach, hypnotherapist and energy worker) – I slowly crafted my own step-by-step process and suite of visual coaching tools … called The SHIFT-IT Visual Coaching System®. Through my Visual Coach Certification I empower other helping professionals from across the English-speaking world to employ Visual Coaching and SHIFT-IT with their own clientele. This video and article are excerpted from my FUNDAMENTALS OF INTERACTIVE-VISUALS course where I teach the ins and outs of visual process work with groups and individuals. This course is designed for Process Professionals: leaders, managers, consultants, facilitators, trainers, coaches, therapists, graphic recorders, energy/body workers and other process workers. And for artists, illustrators, designers and other creatives. 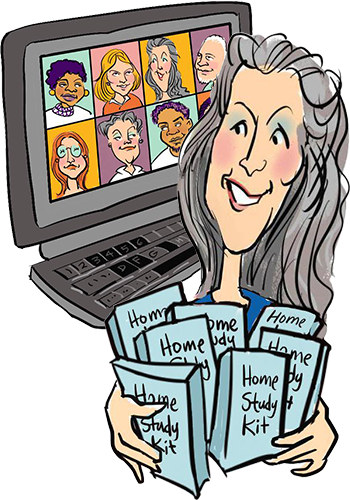 Course is available In-Person (in Victoria, BC Canada once a year) Online (via webinars in fall and spring) and via Home Study (anytime).